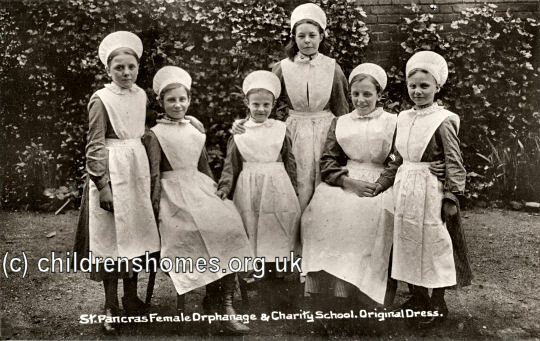 St Pancras Female Orphanage and Charity School was founded in 1776 to maintain, clothe, educate, and train for domestic service female orphans belonging to the parish of St Pancras. 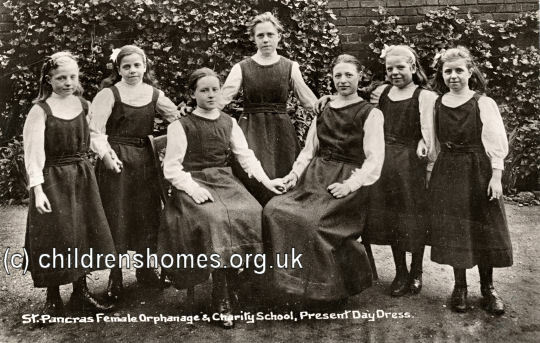 The Orphanage occupied premises at 108 Hampstead Road, London NW1, which in 1890 could accommodate 65 girls. Admission was by a periodic election of the charity's subscribers, with those received being between 9 and 11 years of age. In 1904, Lord Southampton laid the foundation stone for a new building on the site, designed by E.W. Hudson. Du to constant shortage of funs, the new building appears to have never been occupied to anywhere near its capacity. By 1930, the age of admission had been widened to between 4 and 12 years of age, with 46 inmates then in residence. In the early 1900s, a group of the girls modeled the institution's 'old' and 'present-day' uniforms. In 1945, the Trustees of the Orphanage sold the premises to the adjacent National Temperance Hospital. The premises are now occupied by the Margarete Centre. Former St Pancras Female Orphanage.